Each week exciting new slots are released by a variety of developers. The games are always built on a huge range of themes and come packed with winning opportunities. The last few days have been no exception and there have been some fantastic games released. The slots take you on a fantasy adventure, exploring ancient secrets, out on the streets to watch exciting shows and much more. Here we take a look at three of the latest releases and explain to you exactly how they can help you to win big. Read on to learn all about them, then pick your favourite and start playing today. With a bit of luck the winnings will soon start flooding in. If you are one of the many people that enjoy fantasy adventures set in a medieval world full of castles, dragons, knights, and great treasures, then NetEnt’s latest slot release Fire Siege Fortress is the perfect game for you. It is a 5 reel slot with variable rows and 576 ways to win. This means that you win payouts just by landing matching symbols in adjacent rows starting from the left hand side. The reels are set in the wall of a castle with a heavily armoured soldier standing guard at the side. There are five high value symbols, the dragon, the soldier, the sword, the axe and the mallet. The lower value symbols are the playing cards 10, J, Q, K and A. There is a fiery ‘Wild’ symbol, it can substitute for all of the other symbols, except for the scatter, to help and form winning combinations. The scatter symbol is a crown. There are three mini bonus features linked to the wild symbol that can be triggered when the wild lands at the bottom of reels two, three or four. If it lands at the bottom of reel two the Archer Attack bonus is triggered and up to three wild symbols are added to the reels. If it lands at the bottom of reel three the Dragon’s Breath bonus is triggered and the third reel becomes completely wild. If it lands at the bottom of reel four the Trebuchet Assault bonus begins and one or two giant wilds are added to the reels. If you can land the crown scatter symbols on reels one, three and five simultaneously the Fire Siege Free Spins begin. If the crown lands in the top row of the reel it will award six free spins and it will award three free spins if it lands anywhere else. This way you can win anything from 9 to 18 free spins. If you land just two crowns but one of them is in the top row then you receive three free spins or a Tower Coin Win worth 5x your total stake. Fire Siege Fortress has a betting range of £0.20 up to £200 so it is very affordable. The dragon offers the top payout of 120x, the soldier can payout up to 100x, and the three weapon symbols can all payout up to 40x. The five lower value symbols can all payout up to 20x. However, these are multiples of the total bet, not a payline bet, so the payouts are more generous than they first sound. 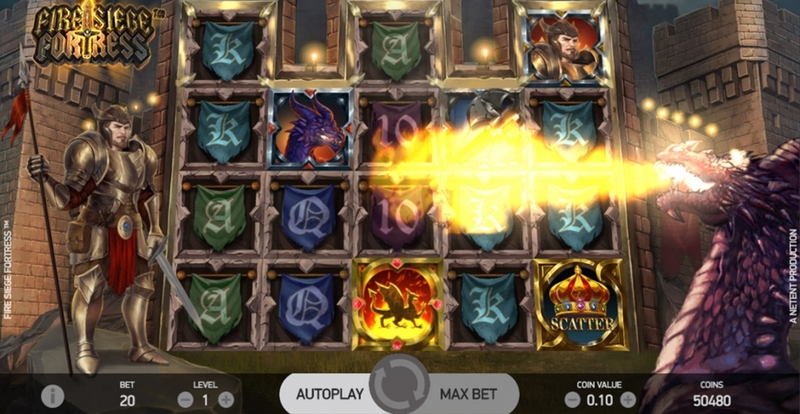 As with all games from NetEnt, this is a fantastic looking slot with great graphics and sound effects so go on this exciting fantasy adventure today and with a bit of luck you will find plenty of treasures inside the castle. 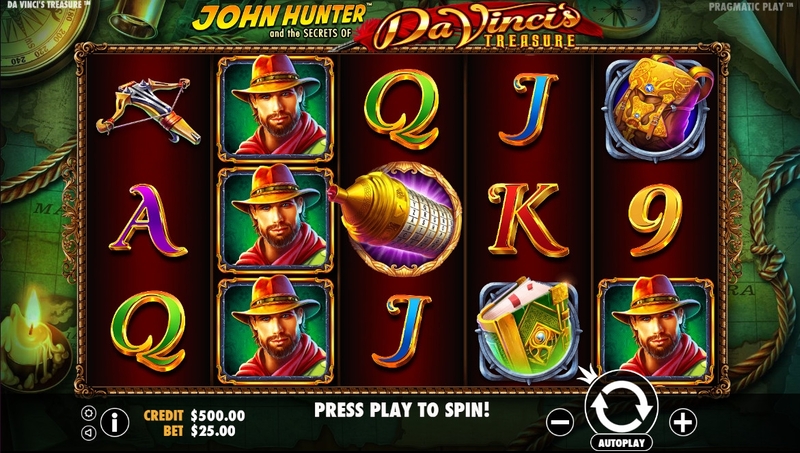 Pragmatic Play is taking players on an adventure to uncover the lost secrets of Leonardo Da Vinci in their new release John Hunter and the Secrets of Da Vinci’s Treasure, and you could find a huge amount of winnings along the way. It is a 5 reel slot with 3 rows and 25 fixed paylines. The ornately framed reels are set against a backdrop showing a map, a compass, and a burning candle. There are a number of high value theme related symbols including John Hunter, a book, a crossbow, a backpack and a model of Da Vinci’s helicopter. The lower value symbols are the playing cards 9, 10, J, Q, K and A.
Da Vinci himself is the wild symbol, he can land on all the reels except for the first and substitute for all of the other symbols, except for the scatter, to help and form winning combinations. The scatter symbol is a cryptex. Map Quest – You need to spin a fortune wheel to progress along a map trail. As you go you will win cash prizes and the game continues until you land on the ‘Game Over’ segment on the wheel. Multiplier Free Spins – You win twelve free spins complete with a payout multiplier that increases with each spin. Landing three more scatters will award more spins and this way you can win up to 60 free spins. Prize Picker – This is a simple picking game in which you choose from three items for a cash prize. The slot gives you the chance to gamble your wins from bonus features. You can try to double, triple, quadruple or even quintuple your payout by playing a simple picking game. You simply pick from a number of objects, one of which will award the multiplier. If you pick incorrectly then all winnings are lost. The slot has a betting range of £0.25 up to £125 per spin so all players can enjoy it. There is a top payout of 800x for landing five John Hunter symbols along a payline, the book and backpack can both payout up to 500x, and the helicopter and crossbow can both payout up to 300x. A, K and Q can all payout up to 150x, while J, 10 and 9 can payout up to 100x. Why not join John Hunter today as he tries to uncover Da Vinci’s secrets. With a bit of luck, a few spins of the reels will lead you straight to some huge winnings. If you enjoy watching street performers, and in particular magicians, then Play N Go’s new slot release Street Magic is just the game for you, and with a bit of luck it will soon have you pulling winnings out of a hat. 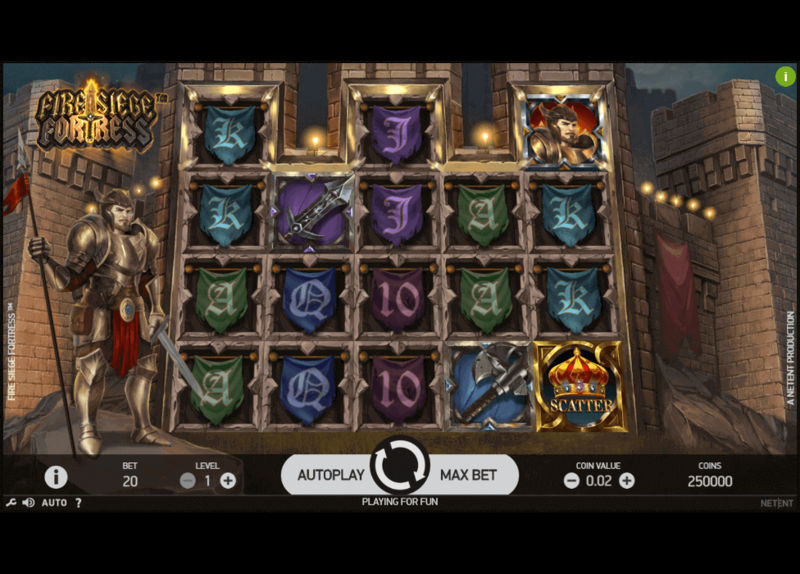 Street Magic is a 5 reel slot with 4 rows and 20 fixed paylines. The reels are in a simple frame against a dark purple background. There are a number of high value symbols including a jewelled ring, a hypnotic pocket watch, a padlock, a knife and a pair of handcuffs. The lower value symbols are the playing card suits symbols, hearts, diamonds, clubs and spades. The magician is the wild and the scatter symbol, which means that he can substitute for all of the other symbols to help and form winning combinations. The Expanding Man– Both magician symbols expand to fill all positions on their respective reels. The Transporting Man– An extra magician scatter symbol is added to the reels and the free spins begin. The Wild Shuffle– Four extra wild symbols are added to the reels and any new payouts will be evaluated. If you land three of the magician symbols anywhere on the reels then you are given the choice of three cards. They will award you eight, ten or twelve free spins. During the free spins any wilds that land on the reels will remain in place for the duration of the spins, and if you manage to land at least one wild symbol on each reel then you will win a further four, six or eight free spins. Street Magician has a betting range of £0.20 up to £200 per spin so it is very cheap to play. The wild symbol and the ring offer the top payout of 500x. The pocket watch can payout up to 300x, the padlock can payout up to 120x, the dagger can payout up to 100x, and the handcuffs can payout up to 80x. The heart, diamonds, club and spades symbols can all payout up to 20x. If you want to inject a bit of magic into your play then set the reels spinning on this exciting new slot today.